We All Scream for Pie! There are two things in London that will always have my money: a good pub with a Guinness and pies. Pies are an institution here. I am not talking about the sweet type pies. 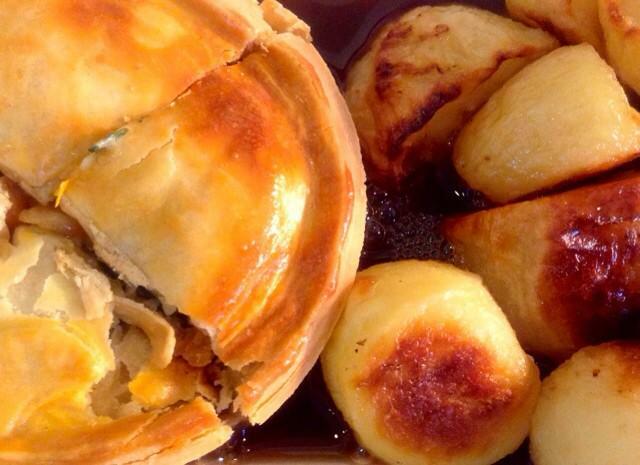 I am talking about the 'steak and ale', the 'chicken and potatoes', and so many other succulent and warm fillings when you rip the crust of a good hearty pie. To my surprise, I ran by accident into what has become a favorite pie place. The only downside (and maybe that is a good thing considering the calories) is that it is too far from my house. But, it may be a nice place to visit, specially if you are an Arsenal fan (which is not my case but I can ignore that fact for the pies). Piebury Corner started as a stall in 2011 serving pies to Arsenal fans on their way to the games. It didn't take long for the stall to become a store in 2012. Considering the quality of the food they offer and the selection of real ales, craft beers and ciders I am not surprised. The 'steak n Guinness' is my favorite. But I have tried the 'chicken and mushroom', the minced beef and onion' and the vegetarian (yes, they have veggie options!) 'butternut squash/onion/goat's cheese'. The price is also fair. You can have the pies to go or enjoy them there with a side of mashed potatoes and gravy. Seriously, go!